Meathead Movers is here to take care of the heavy lifting for you on your move to Palmdale. Our clean-cut student athlete movers are ready to get you safely settled into your new Palmdale home. 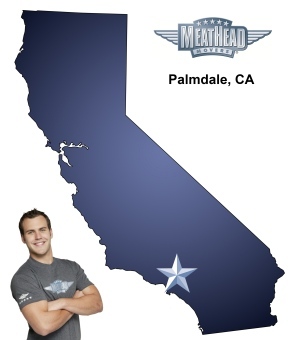 Welcome to Meathead Movers of Palmdale! From its great schools to its abundance of parks, Palmdale is known as a great place to raise a family. If you are considering a move to Palmdale, Meathead Movers is the moving company for you! Our professionally trained student-athlete movers and our moving concierge service are here to help you with every stage of your move in Emeryville. Palmdale is separated from the greater Los Angeles metropolitan area by the San Gabriel Mountains, which allows residents to enjoy a quieter lifestyle while still having access to many of the area’s great shopping, entertainment and dining options. Palmdale has many amenities, including a mass transit hub, several parks, recreation buildings and even a water park. With all these great features, it’s no wonder that Palmdale is one of the fastest growing cities in the nation! If you are considering moving to Palmdale sometime soon, be sure to check out what services Meathead Movers has to offer. In addition to local, long-distance, and commercial moves, we also provides reliable packing, storage, on-site relocations, and our moving concierge service. One of the main differences between Meathead Movers and our competition is the people we hire. Many Palmdale movers hire dubious temporary help to move your precious items. That’s not our style. We only hire clean-cut student-athletes movers who go through a rigorous and extensive screening and training process. Another Meathead Difference is how active and energetic we are. Other moving companies like to loaf around and stretch out the job because they charge you by the hour. Not only do we offer fixed pricing plans for long-distance moves, but our movers will also jog around when they’re not carrying your items. In addition to our standard moving services, we also offer several other services to help your move go smoothly. If you need some extra help packing, our sister company, Princess Packers, will ensure that even your most fragile possessions are packed away safely. We also offer our special concierge service that can get you in touch with carpet cleaners, junk haulers, landscapers, or whatever you need to finalize your move. Our support staff is ready to help you seven days a week with any problems that might come up. If you’re thinking about moving to Palmdale, be sure to give us a call. With our 100% satisfaction guarantee, the only thing you have to lose is the stress that comes from moving! So contact us today for a free moving quote and to learn how we can help you on your next move! Moving to Palmdale? Here are some helpful resources. The packers were horrible and a complete waste of money. Items that needed very little wrapping were heavily wrapped and a glass Pyrex dish was not properly wrapped and broke. Several items that were not expensive but I did want to keep were broken. Cheap packing tape was used on my ceramic sugar bowl and a few pieces won’t come off. The checkbook that was with my desk stuff that was packed up is missing. I am beyond disappointed. The movers did an excellent job. They did break one box of glass candles and said nothing to me about it. So I’m not giving them a 10. Fast, courteous and customer service oriented. There was nothing not to like, I liked every part of the pack, move and store. I am looking forward to the final placement of everything, (home). Thank you so much for a very pleasant packing day, due to the efficient and courteous girls.